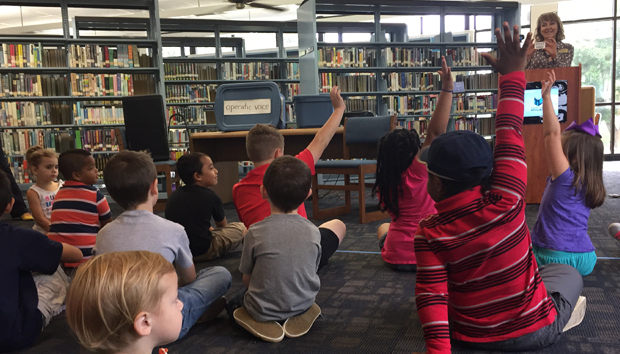 A group of children, who are seated on the floor of the Mary Vinson Memorial Library, raise their hands to answer a question posed by Georgia State Librarian Julie Walker, who is standing at a podium holding a library card. For 80 years, the Twin Lakes Library System has challenged kids to make the most of their summer vacation. Last week, visiting State officials joined local library staff in kicking off Milledgeville’s 80th annual Summer Reading Club. WRGC attended the festivities and presents this report about this latest installment of a local tradition.